A gas explosion led to the collapse of the school building. TWO PEOPLE HAVE been killed and several others injured yesterday after a gas explosion led to the collapse of a school building in Minneapolis, Minnesota. The body of a school employee was recovered around 8pm local time (2am Irish time), at the Minnehaha Academy, according to Minneapolis fire chief John Fruetel. The blast occurred in a utility as students were playing soccer and basketball at the private Christian school, which serves students from pre-kindergarten through 12th grade, according to fire and school officials. Contractors were working on one of the campus’ buildings at the time of the blast, which investigators believe was caused by a natural gas explosion, said assistant Minneapolis fire chief Bryan Tyner. The explosion killed Ruth Berg, a receptionist for 17 years at the school who “welcomed everyone with a smile”, the school said in a statement. John Carlson, a part-time janitor, was reported missing. The 81-year-old attended the school as a child, sent his own children there, and was like a grandfather figure to students, school officials said. At a news conference last night, Fruetel did not specify whether Carlson’s body was the one located. Four people remained hospitalised late yesterday, including one in critical condition, at Hennepin County Medical Center in Minneapolis, according to the hospital. Their names haven’t been released. Dr Jim Miner, the hospital’s chief of emergency medicine, said victims treated from the blast suffered injuries ranging from head injuries and broken bones to cuts from debris. Aerial video footage of the school’s campus showed part of a building was ripped apart, with wood splintered and bricks scattered about. Windows in other areas were blown out and shattered. Three people were rescued from the building’s roof shortly after the explosion and fire, Tyner said. Paul Meskan, who lives across the street, said he was pulling weeds when the blast happened, and he quickly ran over to the school. Meskan said he and other people who rushed to help found a man pinned under the rubble. “We just started digging,” Meskan said. He said that after police and firefighters arrived, they “kept digging, and gas, gas was going. The fire was going. And it’s like, ‘we’re not going back until we get this guy out of here.’ And we got him out, and they got him on a stretcher”. The Star Tribune reported that city records show Master Mechanical Inc. was issued a permit on 7 June for “gas piping and hooking up meter” at the school’s address. Ryan Larsen, a company official, released a statement saying the company was monitoring the situation and referred questions to the Minneapolis Fire Department. Master Mechanical has twice been cited for workplace violations in recent years, according to the newspaper. Jenny O’Brien, a spokeswoman for the Minnesota Occupational Safety and Health Administration, said in 2010 there was a violation related to protecting an employee from falling. In 2014, the company had paperwork violations. At the time of yesterday’s blast, as many as 10 students were playing basketball inside a gym at Minnehaha Academy but weren’t near the explosion, said Sara Jacobson, the school’s executive director of institutional advancement. Jacobson also was in the building during the explosion. “There was a very loud explosion, and ceiling tiles and windows and materials rained down on our heads,” she said. Email “Two dead and several injured after school explosion in Minneapolis ”. 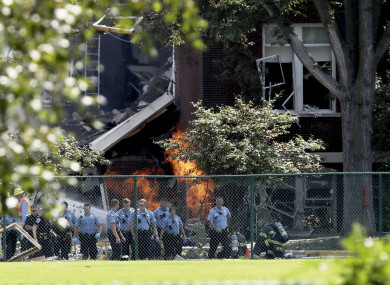 Feedback on “Two dead and several injured after school explosion in Minneapolis ”.